Dramas, musicals, and various fields that they are very active in, it is the 3 members of JYJ! 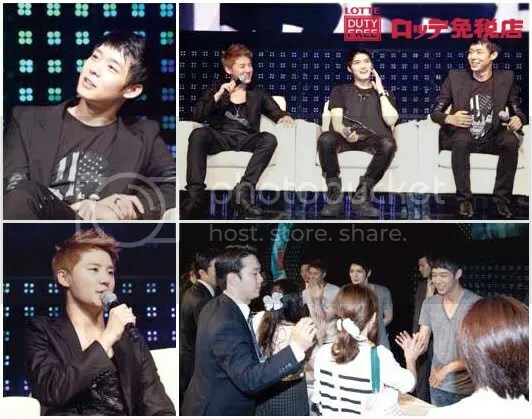 JYJ participated in a fan meeting held by Lotte Duty Free Shop. On September 3rd 3:00pm, the fan meeting was held at the Dome Art Hall at Grand Park in Japan. Appearing amidst the cheering of 2000 Japanese fans, JYJ arrived onto the stage with a powerful dance number “Empty”, energizing the crowd at once. At the talk show after the concert, they started to talk about their current activities. Jaejoong talked about his current drama “Protect the Boss” with Choi Kang Hee, Yoochun about his drama “Miss.Ripley” which had ended just recently, and Junsu about his special appearance in “Scent of a Woman” followed by his Ost song for the drama titled “You Are So Beautiful”. On the day of this talk show, the three of them spoke in Japanese without any translator. It seemed that they wanted to feel closer to their Japanese fans. After the talk show, with the actress Kim Jeung Eun’s narration for the song “In Heaven” from their second album (which has become quite a topic), was brilliantly performed as this painful love song was unveiled. This Lotte Duty Free Shop fan meeting gave the fans not only four live performances but also gave favourite items of the members as presents, high touch times, and had a good time with the fans. The favourite item for Yoochun was his vintage camera, Junsu’s was the glasses he was wearing in a PV, and Jaejoong’s was a keychain that he always used on a daily basis. 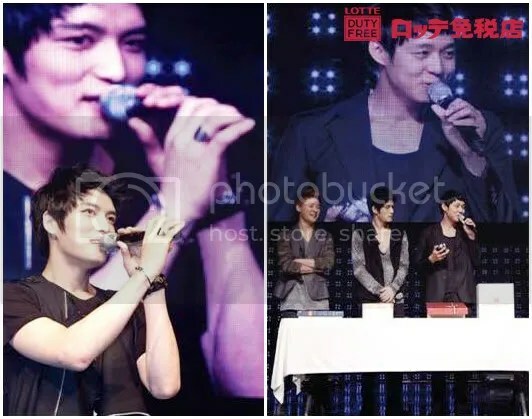 The highlight of the fan meeting, which was the high touch event, took about an hour as JYJ members exchanged smiles and high fives with each of the 2000 fans, leaving the fans with inexpressible feelings. This entry was posted in DTL News Preview. Bookmark the permalink.